There is a palpable cultural landscape in Las Cruces, New Mexico that defines a world of magical realism, solace, rawness and quixotic journeys. 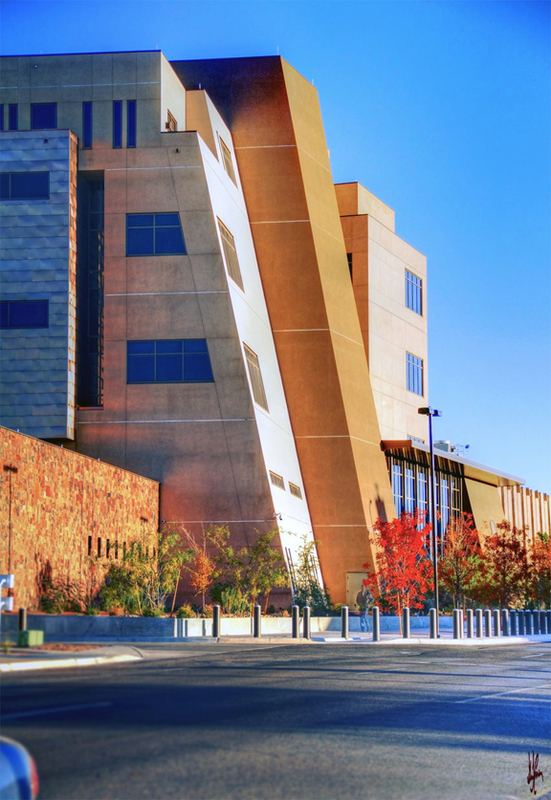 Consequently, the new Courthouse as a national and local symbol must evoke the essential connection to “nature”, while drawing inspiration from the Southwest in general and specifically Las Cruces. As Las Cruces has historically been defined as a “crossroads” by the Camino Real and the Chihuahua Trail to the current national intersection of the I-25 and I-10 highways. The North-South route represents the ancient cultural paths. The East-West roads and paths evoke a more present time established by Spanish and Anglo cultures. The notion of “crossroads” depicts a cultural divide between a fragmented urban core to the west and a rich, historical neighborhood to the east. 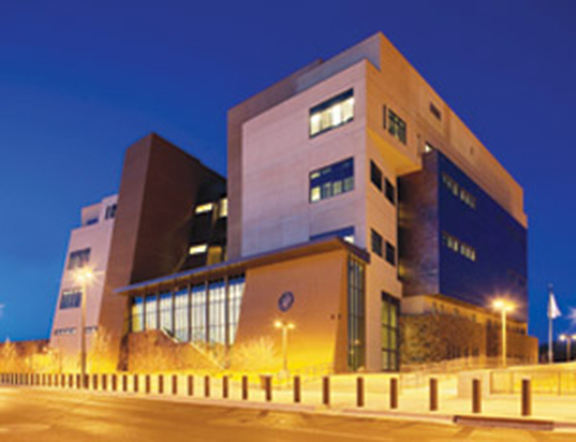 The Courthouse acts as a connective mediating tissue between downtown and the residential scale. 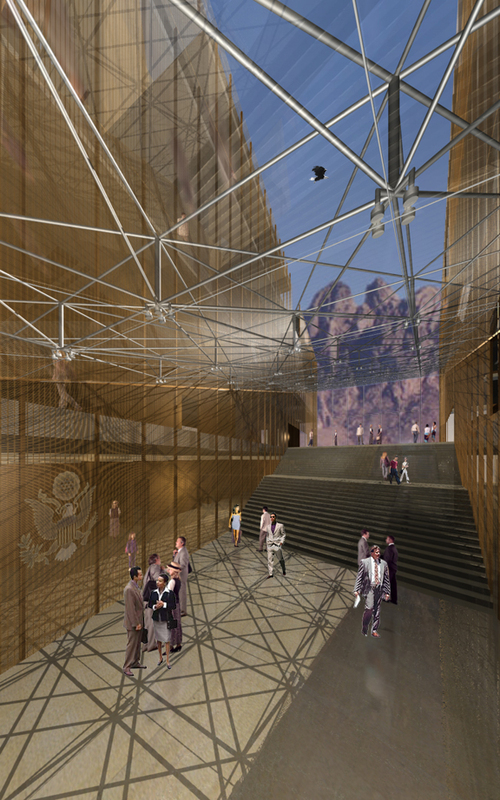 Further, the potential for a visual gateway toward the Organ Mountains, affirms the city’s link to the landscape. The mass of the Courthouse is established by two major divergent pieces that define the entry procession. As abstract references to the twin Organ Mountain pinnacles called “Rabbit Ears,” these two masses contain the Courtrooms and the Judges’ Chambers. Entering the Courthouse, there is a clear sequence of events and processional spaces. As one passes through the security threshold, the cryptic vertical circulation tower rises above the entry with textures subliminally recalling the “Tablets of Justice” of ancient time. 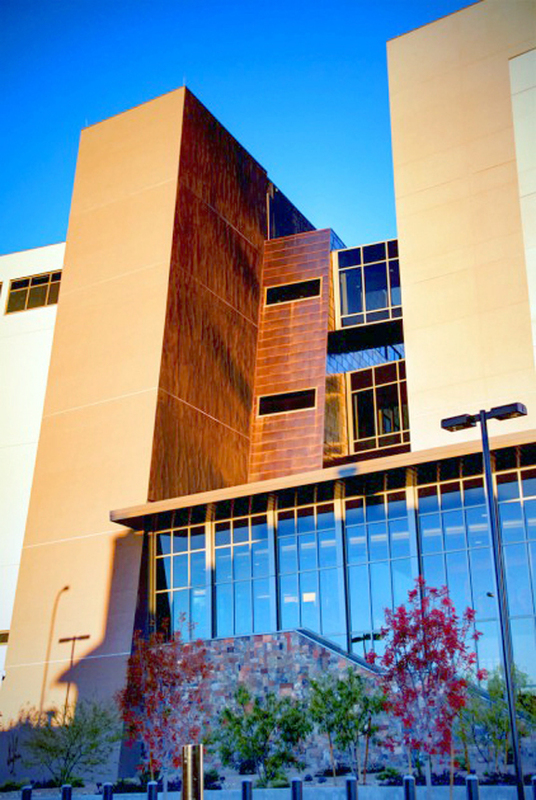 The space, defined by the aura of the copper-lined walls of the two “ears” of the building, is not unlike a canyon, capturing light and reflecting views. 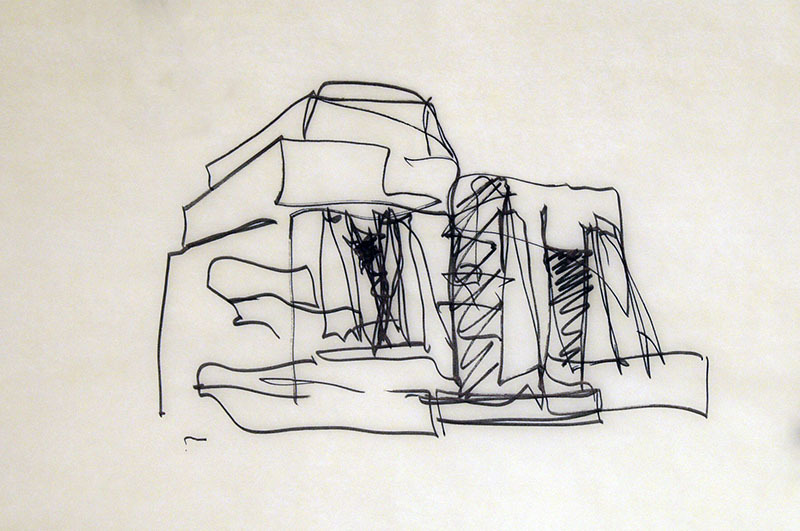 The “courthouse steps” are aligned between these two perspectively divergent sides. The steps guide the visitor up onto the interior stone plaza, unfolding views of the sky, while relentlessly focusing on the mountains. This arrival point is like a “mesilla” or plateau that acts as a communal gathering point. 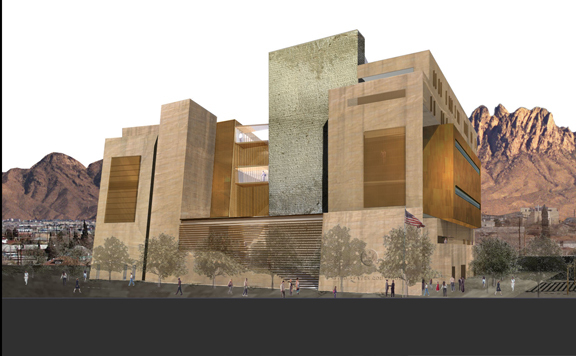 The new United States Courthouse for Las Cruces will at once be a dignified civic monument that focuses the heart of the city, while simultaneously maintaining an appropriate perimeter scale. With the familiar pecan grove atmosphere and communal openness to the culturally rich surrounding neighborhoods, the Courthouse fulfills an urban mission.